Alex McMurray is involved in so many projects (many of which have been featured here), it would be easy to assume that he's the only guitarist in New Orleans. That would certainly be true if you were an attendee of Chazfest, one of the coolest things I've had the privilege to witness. From what I can tell, it's an outdoor concert of all of McMurray's bands (plus a few others) featuring New Orleans celebrity Washboard Chaz taking solos, all in McMurray's backyard. Unfortunately, due to the rising rents in the Ninth Ward (let's not kid ourselves and call it what it ain't, Sotheby's) this was the last year of the festival. For now, anyway. 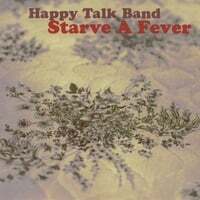 While I heard a lot of amazing music there, the band that touched the darkness in my heart the most was the alt-country act Happy Talk Band. Lead singer and songwriter Luke Spurr Allen commands the stage with a growl and purpose of a maniac. Songs like "Mugger's Waltz" display an acid wit -- it's easily one of my favorite songs that I've heard this year.